* The service Electiona Widgets allows you to include all the modules that you need on any page associated with a single domain, which will be provided during the checkout process and that will be configured on our servers by our technical team. 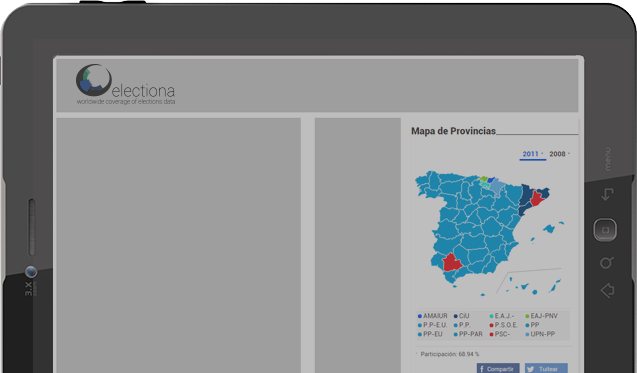 Electiona Widgets is offered as a service for each electoral process so the purchase includes data and graphs only for the identified process. The service period starts when you contract the service and lasts until 30 days after the election date, when the service will be disabled. During the counting process the information is provided in real time. The counting process can eventually end without reaching 100% of the votes, and will usually reach values higher than 99%. This is due to votes sent by mail or issues in the process itself, both things being beyond our control. The standard infrastructure is designed to support 100.000 hits per hour under the free service and 360.000 hits under the Premium service. Standard support service provides a response time of less than 8 hours (business hours) through email or online application. Premium support service provides a response time of less than 4 hours (business hours) and real time support on the elections day from the start of the scrutiny until 24:00.